Here's what's happening in May on the Tualatin River National Wildlife Refuge. May is a good time to visit the Refuge if you've never been here. The seasonal trail opens May 1, and combined with the year round trail, offers approximately three miles for walking and more opportunities to see resident wildlife which includes deer, raccoons, coyotes, muskrats and fox squirrels. May is also prime time for songbirds. Take a walk and look for the beautiful lazuli buntings in the grasslands, black-headed grosbeaks and western tanagers in the forest, and common yellowthroats in the wetland margins. Come early and bring your camera or your spotting scope. Thursday, May 3, 7-9 p.m. The discussion will cover the following topics: why shoot night photography, types of night photography, equipment, preparation and planning, and how to shoot. Most of the in-depth discussion will focus on Milky Way photography. This group is open to anyone with an interest in nature photography and any type of camera. Wednesday, May 9, 1-2:30 p.m.
Tuesday, May 15, 10-11:30 a.m. This preschool environmental education program invites children and their families to spend the morning learning about the natural wonders of the Refuge. Volunteer naturalists will lead nature crafts, share stories and guide hikes on Refuge trails. The Refuge supplies "froggy" raingear for the kids, but adults should bring their own. Each date offers a different theme, so Puddle Stompers are encouraged to visit on multiple days. This event is free and open to the public, but registration is required. Contact Seth Winkelhake at 503-625-5944 with questions. Friday, May 11, noon-2 p.m.
Saturday, May 19, 10 a.m. - 4 p.m. The festival is our biggest event of the year. It is sponsored by the Friends of the Refuge, in partnership with the Refuge, to celebrate natural world that surrounds us. Plan to spend the day and sample some of the many family-friendly activities. For early risers, start the day with walks to listen and look for birds greeting the dawn. The walks will be led by long-time birding experts starting at 5:30 a.m.
Festival activities begin at 10 a.m. and will the offer kids and adults plenty to do. 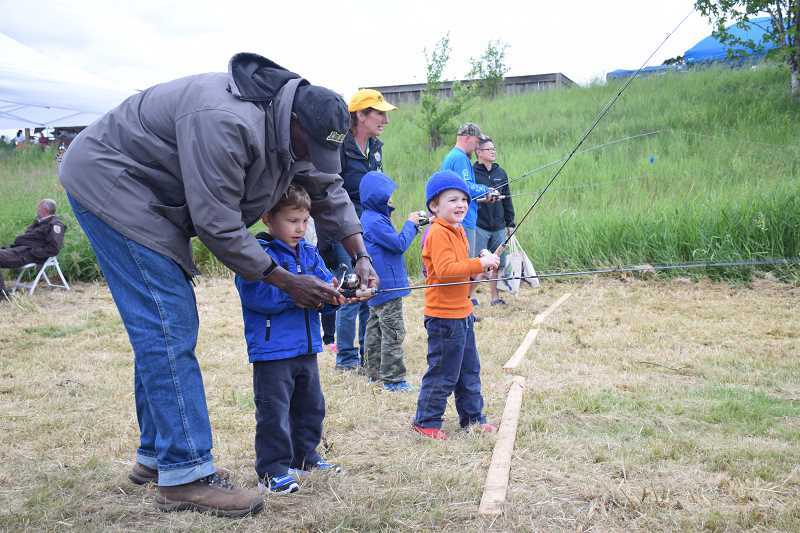 The kids can build a bird house to take home or paint a duck decoy, visit a pond study and see the tiny world that lives in the water, or try their hand at the backyard fishing station. The always-popular Conestoga style wagon rides will be back to give you a tour of the Refuge. If you prefer, you can walk the Refuge and visit the interpretive stations along the trail to learn more about the plants, animals and birds that call the Refuge home. The Nature Store will be open and offers a wide selection of books and field guides about nature as well as gift items for everyone on your list. Conservation exhibitors will be present to answer questions about their organizations and explain ways you can help protect the environment. Free festival parking will be available at the office building at 12205 S.W. Tualatin Rd., at the corner of Southwest 124th and Pacific Highway. Free shuttle buses will provide continuous transportation to the Refuge from 5 a.m. to 5 p.m. There will be no onsite parking at the Refuge. For complete up-to-date information about the festival, go to HYPERLINK "http://www.friendsoftualatinrefuge.org/" http://www.friendsoftualatinrefuge.org or call 503-625-5944, ext. 227.